Tuibumbi is a technical term for special prayers, which are recited at the end of Manchu shamanic rites, when the lanterns have already been extinguished. It is, therefore, possible to paraphrase it as “praying in the darkness”. The origin of this ceremony is still unknown, though some explanation can be found for it in Manchu folk tales. These prayers are generally addressed to female divinities, and some examples are already known from the Manchu dynasty’s “Imperial Shamanic Ritual” Manjusai wecere metere kooli bithe. 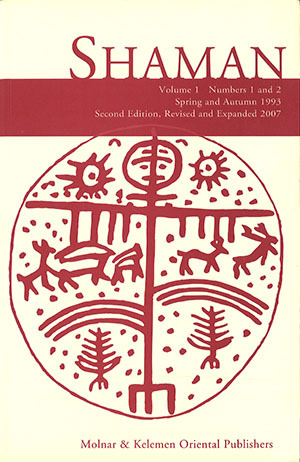 In this paper, the author gives a translation and a critical analysis of some newly discovered tuibumbi-prayers, collected mostly in 1981 in Jilin province, Manchuria. Kamidari occurs predominantly among the shamans of the Okinawan district during the initiation period. Kamidari includes a wide range of states: psychosis, various hallucinations, and somatic complains, which are often the concomitants of daily difficulties such as economic hardship or conflicts among the family members. The authors found that the shaman’s personality factor, unfortunate life events and the environment were all causes of the symptoms of kamidari. The practice of worship as well as the human relationships surrounding the shaman help her or him to overcome the dysphoric state of kamidari. Based on these results, the clinical and cultural aspects of kamidari are discussed from the viewpoint of social psychiatry. MIHÁLY HOPPÁL (Budapest): Report on the “Shamanism as a Religion: Origin, Reconstruction and Traditions” Conference Held in Yakutsk, August 15-22, 1992. ROBERTE N. HAMAYON (EPHE, Paris): Are “Trance,” “Ecstasy” and Similar Concepts Appropriate in the Study of Shamanism? The terms “trance” and “ecstasy” are used in many definitions of shamanism to mean both a culturally defined form of behavior and a specific correlative physical and mental state. In fact, however, there is no evidence to indicate that this identification is warranted. According to the symbolic representations of shamanistic societies, the shaman’s ritual behavior is the mode of his direct contact with his spirits; hence it is functional behavior that follows a prescribed pattern. The use of the word “trance” to describe the shaman’s behavior, associated as it is with a specific physical and psychological state, has given Western religions an excuse to condemn this type of behavior, the associated state being considered in the seventeenth and eighteenth centuries as wild and devilish, and later, as pathological. What is in fact condemned is the assumption implicit in shamanism, i.e. that man and the spirits are similar in essence and status, a hypothesis which is unacceptable to ideologies based on divine transcendence. The article focuses on the classificatory logic in the oral poetry of the Tamang shamans in Nepal. Three types of specific phraseological configurations are examined to demonstrate how and to what extent “doctrinal content” of extra-textual provenance and intra-textual phonic-prosodic potentials interact. This interaction, it is argued, results in poetic qualities which are likely to enhance the persuasive effect of the text in performance, and also to condition the formation of the text as part of an oral tradition. The discussion concludes with a plea for a more text-based approach to shamanism in ethnography and comparative research. This article points out two different types of folk tales that have been grown up around shamans. Where shamanism occurs among simple hunting peoples the shaman is likely to be spoken of as a gifted and distinctive individual, and will, perhaps, be considered to be more mysterious after his/her death. However, as a rule, he/she is still considered to be a human being. Among the nomads of northern Siberia, however, the shaman is part of a more complex society: after death, he/she may be the object of a regular cult, and the tales told will make him/her into a hero/heroine of divine status. The tales, thus, become myths, and the shamans are transformed into gods. The Kun-ning-gung, located behind the main palaces of the “Forbidden City,” was – together with the Tangzi temple – the Qing court’s centre for shamanic rituals. While the Tangzi has been completely destroyed, the Kun-ning-gung palace is still open the public: visitors to the main hall will find some shamanic furniture, and can then proceed to the kitchen where the sacrificial meat was cooked. The rituals celebrated in this hall were carefully described in the “Imperial Shamanic Ritual” (in Manchu Hesei toktobuha Manjusai wecere metere koolo bithe) completed in 1747; it is the most significant passages and prayers of this ritual that are translated here.